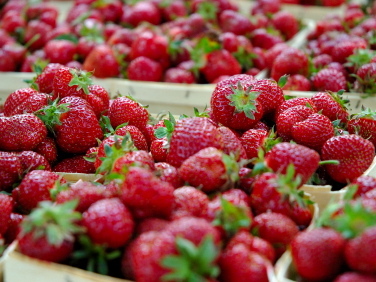 The pickup: A half-flat of strawberries at the Thursday market. The results: My intention was to make an easy boccone dolce for a gathering of moms and daughters in the mountains, but when I couldn't find the meringue cookies at the store I picked up a package of ladyfingers instead. My daughter and I made trifle, completely winging it, with only a foggy idea of what trifle is and no recipe (magazine, cookbook, or site) to guide us. First I washed four pints of berries, then sliced them into a bowl and tossed them with a bit of sugar. I set them aside and we went for a bike ride. Later I scooped a cup of the berries into the blender, added all the accumulated juice from the bowl of berries along with a quarter-cup of Triple Sec, then puréed. Meanwhile my daughter whipped the cream to soft peaks (with just a little sugar), then lined a large glass bowl with the ladyfingers. I poured about half the purée over the ladyfingers and my daughter topped this with a layer of the cut berries, then spooned over a layer of whipped cream. Another layer of cookies, the rest of the purée, then all of the berries and a final layer of whipped cream. 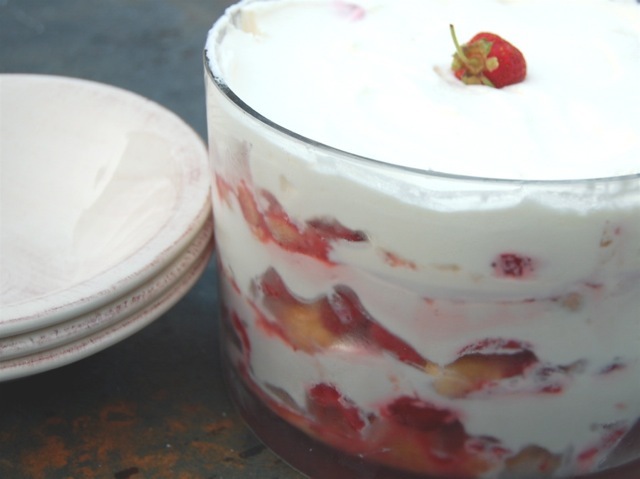 [%image trifle width=350 float=right caption="Faux Trifle. "]We put it into the refrigerator and left it alone for three hours. By the time we served it up, the ladyfingers had absorbed all the purée, turning into a delicious sponge-cake-like consistency. Add to that the combination of fresh, sweet strawberries and whipped cream, and what materialized was a fantastic dessert. When I got home I delved into several cookbooks, looking for trifle recipes; I discovered that they almost always include a custard or pudding. Maybe next time? Probably not, as our Faux Trifle was incredibly easy to throw together, devoured within minutes, and the only disappointment expressed was that there wasn't any more.